PEBBLE BEACH, Calif. (AP) — Bill Murray met a pair of baby kangaroos from the Monterey Zoo. Jerry Kelly tried to mimic the peculiar post-swing moves of Ho Sung Choi. Jordan Spieth sent players and fans along two fairways on a frantic search for his tee shot. 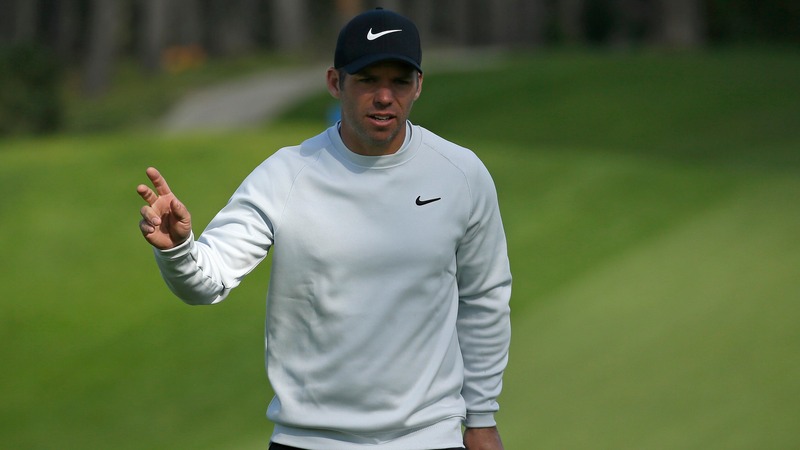 All that commotion on celebrity Saturday at Pebble Beach, and Paul Casey missed it all. He was over at Spyglass Hill, putting together another solid round in the sunshine, rain, cold and wind. Casey had a 5-under 67 and quietly built a three-shot lead over Phil Mickelson going into the final round of the AT&T Pebble Beach Pro-Am. As a result, Casey is the -150 favorite to win the tournament according to odds listed at Bovada on Saturday night. Mickelson is +300. Mickelson delivered plenty of golf entertainment at Pebble Beach, particularly a wedge into 3 feet on the 13th for birdie and a 4-iron he crushed with the wind at his back to 4 feet for an eagle that turned his fortunes, led to a 2-under 70 and put him in good shape for a shot to match Mark O'Meara's record of five titles at the AT&T Pebble Beach. "I thought anything in the 60s was going to be a heck of a round, and I was one shy," Mickelson said. "But I've got a good chance going into tomorrow. I'm looking forward to it." History might be on Lefty's side. Casey, who was at 15-under 200, has never won in his three previous times with a 54-hole lead on the PGA Tour. Those all occurred in the last three years, and while he was beaten by great closing rounds of great players, Casey shot 2-over par or worse. But that was the least of his concerns. "I am having a blast," said Casey, who last year rallied to win the Valspar Championship during the Florida swing. He made his PGA Tour debut 18 years ago at Pebble Beach, missing the cut with Seth Waugh, now the chief executive of the PGA of America. He played again, and then he didn't return for 16 years. Part of that was his European Tour membership, with events in the Middle East. Some of it was injury. Some of it was weather. "There are two factors," he said. "One is the weather. If you have great weather, this is one of the best places on the planet. And two, if you have the right partner, it can be wonderful. I can at least guarantee one of those elements." He is playing with Don Colleran, the chief sales officer at FedEx, and they have a four-shot lead in the pro-am. The other factor? Not so much. Saturday began under a blue sky and a sunshine beaming down on the Monterey Peninsula. Those patchy clouds of the horizon were part of a painting. They moved in quickly, dropping temperatures 10 degrees, causing flags to whip and rain to spray. That's not what stopped Spieth. He was tied for the lead after a birdie on the par-3 fifth hole and remained in range of Casey until the final six holes. His downfall began with a shot on the 13th hole he yanked so badly he figured it was in the bunker on the left side of the ninth fairway. It wasn't there. The ball in the first cut of rough? That belonged to Adam Scott's amateur partner. Spieth even went down to the edge of the Pacific to look, and panic began to set in. "Um, if you all could check around you for a ball, that would be really helpful," he said. With under a minute left in the new three-minute search, it was spotted 140 yards back toward the tee beneath a tree it struck. Spieth made double bogey, and then another double bogey on the 18th hole when he pulled his tee shot off the rocks and into the ocean . He shot a 74 and went from in the hunt to eight shots behind. He didn't feel he was hiding the ball as well as the first two days, so it was a matter of time. "It was going to bite me at some point," Spieth said. "I didn't necessarily deserve to be a couple under par at the time, and so it ended up kind of haunting me there. ... I drove the ball well the last two days, and then today my driver just didn't behave at all. It was a 150-yard spread on either side and that's not good around Pebble Beach." Lucas Glover had a birdie-bogey finish at Monterey Peninsula for a 1-under 70 and was at 11-under 204, along with Scott Piercy (69 at Spyglass Hill). Glover and Piercy are each 12/1 to win. Casey was recently in the news for a tournament he didn't play, the Saudi International, a new event on the European Tour that came under scrutiny for Saudi Arabia's human rights record and the recent killing of journalist Jamal Khashoggi. He was on the original list of commitments without his approval, and said he was never going. Casey is an ambassador for UNICEF and has the logo on his golf bag, which he displayed on an Instagram post to confirm he was not playing. "I stand firm on what I said," Casey said. He is more interested in what he can accomplish Sunday at a tournament that, with reasonable weather and an enjoyable amateur partner, he has come to enjoy. DIVOTS: Mickelson made the cut for the 500th time in his PGA Tour career. ... The top 60 and ties advance to Sunday because of the pro-am format, while the top 70 and ties still get credit for a cut made. Adam Scott three-putted from 8 feet on the last hole to miss the playing cut. ... PGA Tour commissioner Jay Monahan and Keith Mitchell had a chance to advance to Sunday, but were eliminated from the 25 pro-am teams based on matching scorecards.